By the early 1980’s, the once powerful Shaw Brothers Studios was a shadow of its former self. To make matters worse, The Hong Kong new wave was in full swing. Rival studio Golden Harvest had risen to prominence on the strength of the "Terrific Trio." The acrobatics and superb comic timing of Jackie Chan, Sammo Hung, and Yuen Biao dazzled audiences worldwide. By contrast, the Shaw Brothers approach seemed hopelessly dated. The career path of Shaw Brothers in-house filmmaker Chang Cheh seemed to mirror the decline of the studio itself. In the 60’s, he was making large scale epics like One Armed Swordsman. By the late 1970’s, his budgets had dwindled and the scope of his films had diminished. It was during this period that he began working with a quintet of actors known as the Venoms, with whom he did a series of films. The very last of these productions was released in 1982. That same year, a pseudo-venoms movie by Chang was also released. It merits comparison with the very best from that bunch. It was titled Five Element Ninjas. Five Element Ninjas opens in the midst of a massive martial arts tournament. Two competing factions face off to decide who shall be crowned rulers of the martial world. On one side is the Alliance, a valiant brotherhood lorded over by the noble Yuan Zeng. The Alliance competes with the treacherous Chief Hong and his pupils. Hong has enlisted the help of a Japanese samurai to ensure victory. The samurai wins his first match against a younger, inexperienced opponent. He then shames the loser into committing suicide. Enraged, Alliance brother Liang Chi Sheng (Lo Mang) immediately challenges the samurai to another match. Opting to fight with his bare hands, Liang swiftly bests the samurai in combat. In a turning of the tables, Liang taunts the samurai by suggesting that he deserves the same fate as the Alliance member he defeated. Showing that he indeed has the courage of his convictions, the samurai commits seppuku. Before succumbing to his self-inflicted wounds, he instructs Chief Hong to deliver a message to a ninja named Cheng Yun. Sometime later, Yuan Zeng receives a challenge letter from Cheng Yun. Cheng bids The Alliance brothers to confront his dreaded five element ninja at a number of designated locations. Each location corresponds with one of the five elements: Gold, wood, water, fire, and earth. Sensing the challenge letter to be a trap, Yuan Zeng splits his pupils up into pairs, each of which is dispatched to one of the five locations. The strategy proves ineffective, as each pair is sliced to ribbons by Cheng Yun’s ninja clan. Cheng then storms the Alliance’s fortress. Yuan and his remaining forces are mercilessly slaughtered, leaving Hsiao Tien Hao as the lone survivor. Hsiao escapes, and seeks the help of an elderly ninja master he’d studied under years before. With the master’s help, Hsiao and three other students become highly proficient in ninjutsu. Hsiao then returns to the Alliance fortress and issues a challenge to Cheng Yun and his five element ninja. Yun answers the challenge, which ultimately comes down to a bloody face-off between him and Hsiao’s team. The “Venom mob” consisted of actors Sun Chien, Kuo Chui, Lu Feng, Lo Meng, and Chiang Sheng. All but Lo Meng and Sun Chien had Peking Opera training. The quintet first appeared together in 1977’s Chinatown Kid. However, it wasn’t until the release of Five Venoms aka The Five Deadly Venoms in 1978 that they became stars. The film wasn’t a box office success in its native Hong Kong, but it achieved instant cult status in the West. American audiences discovered via grindhouses, drive-ins, and independent television stations such as WNEW Channel 5 in New York. Chang Cheh would eventually make 25 or so Venoms films, all of which contained some combination of the troupe. Certain ones featured all five. Others only contained two. Almost every single one of them achieved notoriety among Western cultists. 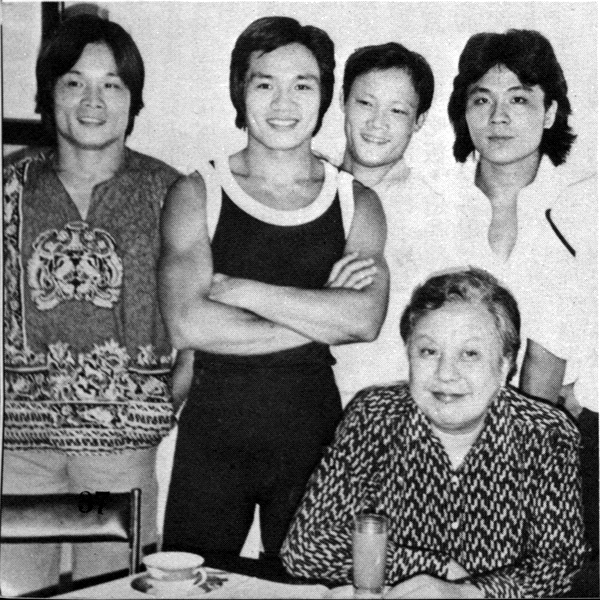 Five Element Ninjas came out during the final year of the Venoms cycle, just before Chang Cheh ended his tenure with Shaw Brothers Studios. Though it only contained one of the original Venoms, it’s always labeled as a Venoms film. Vintage flyer from The 43rd Chamber, a legendary (And now defunct) mom and pop video store that was located in Midtown Manhattan, just across the street from the Port Authority. It specialized in martial arts films and other forms of Hong Kong Action cinema. I first encountered Five Element Ninjas during a late night airing on USA Network in the early 1990’s. It shown as part of a programming package called “Kung-Fu June.” I was far removed from chop-socky entertainment by that point. Nonetheless, I was struck by the film’s garish color palette and graphic violence. I rediscovered it in 1997 on a bootleg VHS tape that I purchased from The 43rd Chamber. It was a severely cropped pan & scan copy with horrible tracking, and the colors bled all over the place. Still, Chang’s vision managed to shine through. It was just that potent. Like many other Shaw Brothers martial arts films, Five Element Ninjas depicts the long standing rivalry between the Chinese and the Japanese in a way that clearly favors the former. The Japanese are shown to be treacherous, as are any Chinamen who would dare consort with them. They are portrayed as mysterious and marauding savages that bring deadly secrets from their native land. The hero must adapt and master the ways of the savages in order to defeat them. Just as in Heroes of the East, the home team ultimately emerges triumphant. Though in typical Chang Cheh fashion, victory comes at a bloody cost, and ultimately proves Pyrrhic. Chang Cheh’s approach to Hong Kong action cinema combined the viscera of Grand Guignol with the traditions of Jingju, or Peking/Bejing Opera. He had no qualms about placing his heroes in the direst of straits. Most of the good guys in Five Element Ninjas are picked off early and quickly, often in the most excruciatingly bloody manner possible. In perhaps the film’s most infamous sight gag, an alliance member slips on own intestines after having been disemboweled by spears that shoot up from the ground. Note that the disembowelment happens gradually, as his intestines slowly seep out of lower abdomen. Though fatally wounded, he continues to fight to the bitter end. By the early 1980’s, Chang’s budgets had severely eroded and the difference was noticeable. The sets looked increasingly obvious with each successive film. Five Element Ninjas turns this supposed flaw into a virtue by combining its meager production values with grandiose imagery. When Cheng Yun bursts from beneath the ground in slow motion with his robs flowing in the wind, it’s an image worthy of manga or anime. The fakeness of the sky behind him only adds to the effect. 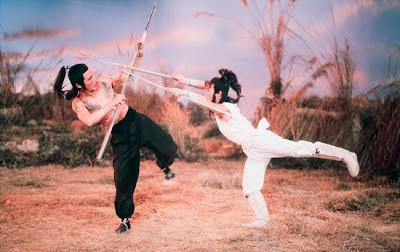 The film’s fights are arranged into a series of vignettes. The motif of each fight taking place at a designated location that corresponds with one of the five elements is repeated twice. During the first act, each confrontation ends in favor of the villains. During the third act, the outcomes favor the hero. These vignettes are perhaps the strangest and most surreal part of the film. Characters inexplicably bend and break the laws of gravity. Though Chang’s career ended rather unceremoniously, his influence can be seen throughout Hong Kong action cinema, and by extension world cinema. It is most evident in the subgenre of “Heroic Bloodshed.” This is likely due to the fact that action maestro John Woo (perhaps the chief architect of “Heroic Bloodshed”) sired under Chang for a time, serving as his assistant director. Though not technically Chang Cheh’s best film, Five Element Ninjas is possibly his most entertaining work. Its influence isn’t nearly as prominent as Five Venoms, but is certainly notable. Known Shaw Brothers aficionado Quentin Tarantino has named it among his favorites. Wu-Tang Clan Member Cappadonna paid homage to the film with a song on his debut album The Pillage titled “Supa Ninjaz.” It stands as a testament to a filmmaker that was considered well past his prime at the time, but still clearly had some tricks up his sleeve. Even a decade after his death, Chang Cheh is without peer. Likewise, Five Element Ninjas exists in a class by itself. Excellent piece, Scott! I remember the 43rd Chamber. Went there once, but they were closed. I think this was right before they shut their doors permanently. Never actually got to enter the doors of the place, but always heard a lot about the place. I first caught SUPER NINJAS in '83 on the Black Belt Feature and instantly fell in love with it. Having seen a bunch of Shaw's at the Drive In, SN was something to behold and all others I would compare to it for a good while, lol. Still, the slashing of Cheh's budgets wasn't TOTALLY down to him being viewed as old-hat. Shaw realized bigger budgets didn't always equate to better movies, and also bigger movies often equated to lesser returns. The rise of the independents had a lot to do with it with guys like Ng See Yuen making a bundle of bread with the littlest of means. It's a shame really. So many of those indy Fu flicks are chores to sit through, but obviously audiences were tired of the seriousness and gore drenched Shaw epic and wanted to laugh for a change. But as you point out, Cheh's movies were assigned to the smaller, more cramped Shaw sets at this time. The widescreen restored versions make this painfully obvious. Still, he did get to use some expansive shots of the Shaw backlot a few times during this time. 5EN was pushed a bit more than Chang's other movies of this time. Shaw's were giving the bulk of the exposure to other filmmakers like Liu CHia Liang and Lu Chin Ku among others. From what I was told by some Asian friends, Cheh's movies were always big in Malaysia and other Asian territories while interest had waned in HK. 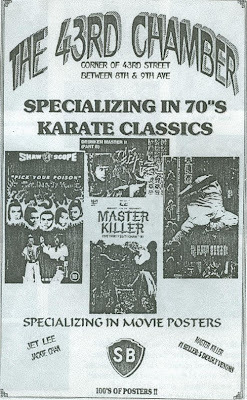 A buddy of mine remembers seeing FIVE VENOMS as a kid in HK at the theater. He's one of the few people I've run into who remembers those guys; well, Lo and Kuo. Lu Feng seems to remain that "guy who always play bad guy." MASKED AVENGERS is another Cheh film from this time period that's exceptionally well made. Highly recommended if you haven't seen that one.